Ron PaulToday, David Barstow of the Times begins to touch on one of the most underreported aspects of Tea Party populism: Its deep ideological and organizational ties to 2008’s Ron Paul Revolution. The press has tended to treat the Tea Party movement as a sui generis outpouring of rage against a black president and an expanding government. But the grassroots network that Barstow examines, Friends of Liberty, has “been shaped by the growing popularity in eastern Washington of Ron Paul, the libertairan congressman from Texas,” he writes. There’s good reason to believe that Friends of Liberty is less the exception than the rule. Flash forward to 2010, and a close look at local Tea Party chapters reveals strong ties with Paul supporters. Barstow reports that the head of Friends of Liberty was first politicized by watching Paul’s speeches on YouTube. The Bay Area rEVOLution, the Paul Meetup group that I profiled in 2008, is now campaigning for “Tea Party” Republican congressional candidate John Dennis and holding a “Tea Bomb” for him modeled on the “Money Bombs” that raked in millions for Paul. 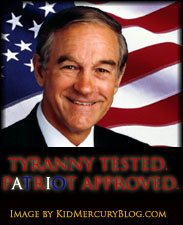 Across the country, 180 Meetup groups now mention both the Tea Party and Ron Paul on their websites. The overlap makes perfect political sense. Paul was the only GOP presidential candidate who was legitimately fiscally conservative and pro-civil liberties (not to mention anti-government). Conservative populists’ fear of what a black president might do with the Patriot Act and their rage over the Wall Street bailouts finds a perfect outlet in Paul’s desire to slash taxes, abolish the federal reserve, and reinstate a commodity-backed currency similar to the gold standard, as well as his tolerance of extremist backers such as 9-11 truthers and neo-Nazis. It’s the reason why Michelle Bachman recently held a town hall meeting with Paul in Minnestota. And why both liberals and conservatives need to pay more attention to libertarians.